Two monks have been referred to trial in Alexandria for the murder of the abbot of their former monastery, according to a statement from the prosecutor-general’s office on Sunday. Isaiah El-Maqary was detained on 11 August on suspicion for the murder of Bishop Epiphanius, who was found dead at Abu Maqar monastery in July. Isaiah has since been officially defrocked by the church due to behaviour unbecoming of a monk. Another monk, Faltaous El-Maqary, was detained on 12 August for aiding and abetting Isaiah El-Maqary. The prosecution stated the two men will be tried on charges of "premeditated murder." On 29 July, 64-year-old Bishop Epiphanius was found dead under suspicious circumstances. 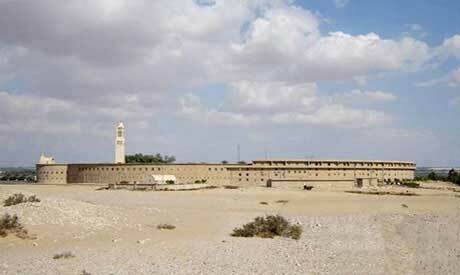 He had led Abu Maqar monastery in Wadi El-Natroun, northwest of Cairo. "During investigations, Wael Saad Tawadros, formerly known by his monastic name Isaiah El-Maqary, confessed to collaborating with the second defendant, Rimon Mansour, formerlyknown by his monastic name Faltaous El-Maqary, to kill Bishop Epiphanius due to personal disagreements," the statement read. The statement said the two men ambushed the bishop on his way from his residence to the monastery chapel, where Tawadros hit him on the head with a steel bar. A post-mortem report showed that the bishop died from severe head injuries, including skull fractures and bleeding. Following the murder, the church has imposed new measures to regulate monastic life. The new measures include a freeze on accepting new monks, a ban on monks’ use of social media, a ban on building non-sanctioned places of worship, and a ban on monks leaving monasteries without official permission.